distribution Ranges across the southwestern 40-50% of the Coastal Plain, including the Sandhills region; essentially absent from the Piedmont, though there is a recent sight report from Wake County. As NC lies at the northeastern end of the range, the northern limits at present are Montgomery, Moore, Lee, Wake, and Edgecombe counties. abundance Very difficult to assess for all five shadowdragons in NC because of their crepuscular habits. As it has been found in practically all potential counties in NC within its range, it must not be truly scarce, and the 54 records with available dates attest to it not being rare. Dunkle (2000) calls the species "common but seldom seen" across its full range, which might apply as well to NC. Likely, it is uncommon to fairly common in the Sandhills region, and rare to uncommon elsewhere in the southern Coastal Plain, but especially scarce in the Piedmont and the central Coastal Plain. flight The flight is from mid-May to late August, though most do not appear until mid-June, and the peak is from late June to mid-July. habitat Small creeks in forested regions, often where sandy and with low flow. behavior Strictly crepuscular, with most flying taking place about 30 minutes before dusk. It spends the remainder of the day hanging on twigs in shade in forests, where very seldom seen. comments To see shadowdragons, observers must visit creeks and other bodies of water in shaded places during the last hour of daylight, with a net handy to catch whatever may be seen flying over the water. 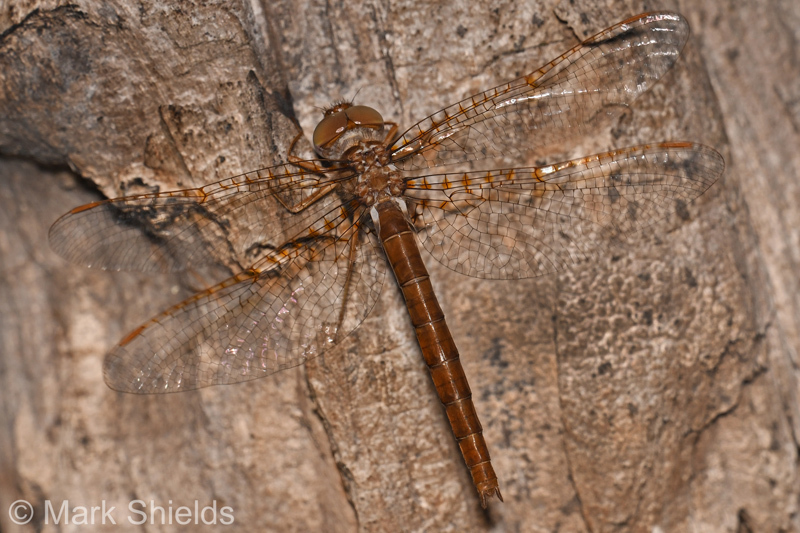 In fact, Dunkle (2000) calls this species "One of the world's most elusive dragonflies" because of its very narrow flight time during the day, often for just 10-20 minutes near dusk. Though it is not rare in the state, it is poorly known by today's biologists/observers, and the NC Natural Heritage Program retains the species on its Watch List. Comment: Richmond; C, 2018-06-09, - SG: Baggett Lake and surrounding area. Photo available. Comment: Moore; C, 2009-07-01, WEWO - antenodal wing spots extend all the way to nodus and the edges of the spots are not bold as in Smoky shadowdragon. Comment: Moore; C, 2007-07-01, WEWO - Found at Paint Hill.